If your panels are tilted more than 10 degrees from horizontal, they’ll self-clean in the rain. It’s really not worth paying to get your solar panels cleaned unless some event has happened to make them spectacularly dirty. How often should you get your solar power system inspected or maintained? In the end, that comes down to how safe you really consider your rooftop solar installation to be. If you ever drive or ride in a car of your own free will, it probably makes sense for you to consider rooftop solar safe. At the start of 2017 around 17.2% of Australian households had rooftop solar. This made for a grand total of over 1.6 million systems. On average, each home has had solar panels installed for 4.8 years, which comes to a total of over 7.7 million years without a fatality – and that’s not bad. Unfortunately, rooftop solar is not perfectly safe. Anything with live current running through it can be dangerous if damaged or defective, and solar power systems are no exception. Fires have resulted from faults and, while most have been small, some have resulted in whole buildings being burned to bits. Having a professional inspect a system can result in problems being identified and put right before they become a danger. The going rate for an inspection by an accredited solar installer is typically $200 to $300. For that money, they’ll check the connections, cables, panels, rooftop mounting, DC isolator switches and inverter. Some offer to do extra tests for more money as part of a premium service, but as far as safety is concerned, I don’t think the expense is worth the benefit. In South Australia, Canberra and Victoria, you must have your system tested every five years by your DNSP. This has to be done by a qualified installer – so arrange for them to do a comprehensive inspection at the same time as their tests. Expect to pay around $200 for this. I would suggest getting an inspection and system test every five years, even if your DNSP doesn’t make you do it. The final choice is down to you. If you want the sense of satisfaction that comes from knowing you’ve done something to keep your family safe, even if it’s only a small thing, have your system inspected every five years to make sure it’s in good working order. Check your install using the checklists at the beginning of this chapter. A good solar installer should happily put any issues right. Even better, before you engage the installer, agree with them that these things have to be done. Use your monitoring system (please tell me you got monitoring!) and common sense to get you and your family into the habit of using more power in the daytime and less at night. 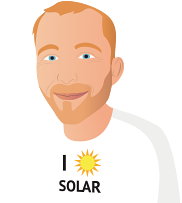 Once you’ve had solar for a full billing cycle, check your bill to ensure your grid usage has dropped and your feed-in tariff is getting paid. Use the tool I showed you (which uses the exact numbers on your bill for consumption and exports) to see if you can get a better deal on your electricity. Mark your calendar to get a safety inspection in five years’ time.